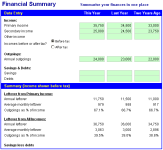 This spreadsheet helps you analyse and understand mortgages. It calculates and compares various scenarios to show the effect of different variables on the mortgage, payments and cost of borrowing. It allows mortgage seekers to make an informed decision before signing a deal. Those with an existing mortgage can see how interest rate changes affect their monthly payments and how much it costs to end their mortgage early. 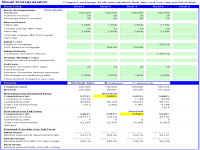 You can download the mortgage calculator at the end of this page. 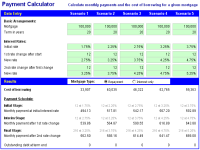 The Payment Calculator and Deal Comparator work with repayment as well as interest-only mortgages. Both calculators and the comparator are designed for mortgages where interest is compounded monthly and payments are made at the end of the month. Results are only accurate for mortgages where this is the case. If you get different figures from your bank or another calculator, check the compounding and payment frequency of your mortgage and how interest was calculated. 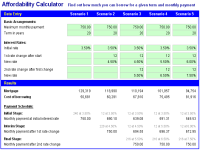 If compounding and payment frequency are not monthly, you will get a slightly inaccurate result from this calculator. However, it may still be useful by giving you an approximate figure. The mortgage calculator was developed by Roger Hautle, the principal behind this web site; it&apos;s free for personal & commercial use and has been downloaded more than 55,000 times. The spreadsheet is easy to use and navigate, and there are plenty of comments explaining terminology in a simple way. I hope you find it useful and wish you all the best in finding a suitable mortgage. The latest version is 4.0b (4 Mar 2017). It works with Microsoft Excel 2007 and later releases. Both links will download the same mortgage calculator but the one with sample figures shows what sort of data to enter.